Dan and Angie Bastian share Connect Business Magazine 2012 Business Person of the Year award. Andy Warhol and Roy Lichtenstein were prominent American pop artists: Warhol for painting red-and-white Campbell’s Soup cans and Lichtenstein for comic strips. Defined according to Webster, the 1950s-‘60s pop art craze involved artists using common, everyday objects as subject matter. 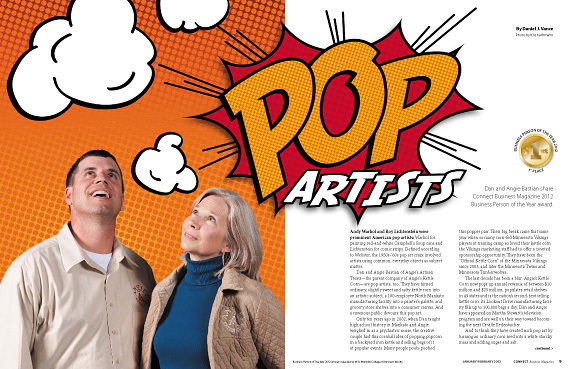 Dan and Angie Bastian of Angie’s Artisan Treats—the parent company of Angie’s Kettle Corn—are pop artists, too. They have turned ordinary, slightly sweet and salty kettle corn into an artistic subject, a 180-employee North Mankato manufacturing facility into a painter’s palette, and grocery store shelves into a consumer canvas. And a ravenous public devours this pop art. Only ten years ago in 2002, when Dan taught high school history in Mankato and Angie weighed in as a psychiatric nurse, the creative couple had this cornball idea of popping popcorn in a backyard iron kettle and selling bags of it at popular events. Many people pooh-poohed this popper pair. Their big break came that same year when so many corn-fed Minnesota Vikings players at training camp so loved their kettle corn the Vikings marketing staff had to offer a coveted sponsorship opportunity. They have been the “Official Kettle Corn” of the Minnesota Vikings since 2003, and later the Minnesota Twins and Minnesota Timberwolves. The last decade has been a blur. Angie’s Kettle Corn now pops up annual revenue of between $10 million and $20 million, populates retail shelves in 49 states and is the nation’s second-best selling kettle corn. Its Lookout Drive manufacturing facility fills up to 100,000 bags a day. Dan and Angie have appeared on Martha Stewart’s television program and are well on their way toward becoming the next Orville Redenbacher. And to think they have created such pop art by turning an ordinary corn seed into a white starchy mass and adding sugar and salt. I’ve heard your first big breakthrough came when you were allowed to distribute your kettle corn to Minnesota Vikings players at training camp in Mankato. Did you just walk up on a cold call to the Vikings and ask if they would be so kind as to try your product? Dan: Basically, yes. We asked permission. We were just starting out and knew this was an opportunity to grow. We talked with a former Minnesota State University student working with the Minnesota Vikings on one of the first days of camp in 2002 and asked if the Vikings would have any interest in trying our snack for free. After popping it, Angie and I brought 120 bags over on a Sunday afternoon. They ate it that night at their meetings. The next day, the Vikings’ sales and marketing staff was just staring at us from a distance as we were popping our kettle corn. They finally came over, said they were with the Minnesota Vikings, and in so many words said our popcorn was crazy good and the players and coaches had loved it. They offered us a sponsorship contract on the spot. We didn’t know where such a sponsorship would lead but we did recognize the opportunity. What happened in this situation was a lot like our company story has been in general. We didn’t have any idea up until the last few years where this business was headed, but decided to just keep on moving forward and see where it would go. The Minnesota Vikings are connected to so many Upper Midwest organizations and people and the sponsorship gave us legitimacy with other organizations. We had been just this small little company setting up a tent at training camp and suddenly they gave us an opportunity set up outside on the Metrodome plaza, which in turn brought awareness of our kettle corn to thousands of fans before every game. You have a simple product with four basic ingredients that most anyone could copy in terms of quality. What were the steps you took to differentiate your products from others in the category? Angie: Most kettle corn in the industry is first air popped and then sprayed with sugar syrup. When we first started producing our kettle corn indoors on a much larger scale, the recommendation from a few consultants was we should change the process to what everyone else was doing. We disagreed. We thought our batch process was the way to go and still do it this way today. How can these other manufacturers call their product kettle corn if it’s air popped and sprayed? Theirs isn’t popped in a kettle. Dan: There isn’t an official definition of kettle corn. Is it defined by the way it’s manufactured or the way it tastes—meaning, the end product that includes sugar? We believe the process as well as the final product should define kettle corn. It’s a product that is slightly sweet and slightly salty. Not everyone else air pops and sprays on sugar. There are many different formulations and processes. Ours is pretty unique, though. It seems there is a little bit of the dreamer in both of you. And as dreamers you have done business differently than most other business people. Do people say you are nuts for doing business the way you do? Dan: How about people in the beginning thinking we were nuts for just making kettle corn? People were nice and didn’t say that to us back then. I was a history teacher and Angie was a psychiatric nurse. We had nice, respected careers and were proud of what we had done in our professions. Suddenly, with this new company, I was running up and down the civic center stairs schlepping popcorn. We had bought a tent and kettle and were popping corn outside the civic center at events. When people we knew asked what we were doing, we just said we had wanted a second business and were trying to raise money for our child’s college fund. It wasn’t a glamorous business. Angie: We were popping in blizzards outside the civic center and the Metrodome for Minnesota Vikings games. Dan: When other people we knew were out having fun and going on vacations, we were working our tails off every weekend, every night, every day. I really didn’t care what people thought, but do remember people at times giving me weird looks. We were just trying to get a business started. Angie: In the beginning, there were a couple factors that helped determine what kind of business we would have. For one, the business had to be part-time. It was also something we wanted our young kids to participate in and learn with us, which could include things for them like sweeping the floor and putting labels on the bags. If we were going to do this business, it would be for the whole family. We wanted our children to participate in realizing a dream. It’s not their dream, but as their parents we are examples and this was our way to teach them that you can have an idea, put that idea into action, and make a go of it. And you have been doing it 10 years. Have your children learned this lesson of living out their dreams? Dan: Our kids are big dreamers. That’s our greatest accomplishment. They are open to dreaming and we share with them they can live out their dreams. Growing up I was not a big dreamer outside of dreaming to be a pro athlete. I had no idea until I was a senior in college I was even interested in teaching. I was just going to school because I liked history classes and liked St. John’s. What was there about your careers that prepared you well for what you are doing now? Angie: The beauty in nursing is that nurses build the relationship with the patient to understand how the patient is responding on every level. That is nursing’s holistic niche, its core. That’s also a skill that can translate to other careers. I run the marketing and public relations division of the company and think I have a pretty good finger on the pulse in terms of how people respond to the product and to our brand positioning. In graduate school, I studied Jungian archetypal psychology and that influences just about every business decision I make in terms of brand positioning, which includes the symbols on the bag, the icons we use—all the archetypes the brand represents. Angie: We have a very serious bag on the front. You have a circle, which is a fully female symbol. Angie’s is a female product. We have that circle on a masculine color, a shade of warm gray. It’s a formal, proper, serious bag for a simple, clean, beautiful product. But as people, we are not so formal, but more casual, and the product is more casual, popcorn. We wanted to elevate the product in a way that speaks to the product quality. So we chose to use paradox to make our bag interesting. We are serious on the front and fun on the back, where we have our picture and have fun telling a story. We were told by just about every marketing professional not to design our bag this way. They said the message we were sending to the consumer was incongruent. But it fits us. This is who we are. It seems you tried to portray the kind of people you are with your bag. It wasn’t plastic, but real and genuine. Angie: Being genuine has always been important to us. We are not plastic or a made up marketing story. We are real people. This is a real business. This isn’t a caricature. There are real people popping this corn, who have real lives. Dan, how has being a teacher influenced what you have done here? Dan: My talent is in engaging people. I was very good at engaging and building rapport with my students. That’s a teacher’s biggest challenge. You have to engage everyone. It’s no different here in terms of engaging staff and on-the-floor people. That was my comfort zone and I just transferred it over into the workplace. And now I work with buyers, who are a tough group. The buyers seem to trust us. This is who I am and how I operate. Angie: If there is any point where teaching, nursing and business intersect, it’s in understanding what people need. What do kids need? What do patients need? And what does that buyer need? And we get them what they need. How big is your company in terms of employees, distribution, and dollar sales? Dan: We have about 180 employees and are distributing nationwide. We are especially strong in the Upper Midwest. We have a lot of geographic holes to fill and the coasts are ripe to grow dramatically. Within the next year, we should be above 20 percent ACV nationally. (ACV, or all commodity volume, refers to potential retail distribution.) We are the nation’s number-two kettle corn in terms of product movement. As for sales, we are in the $10 to $20 million range. What makes this place different from most others to work? Dan: We aren’t necessarily better than anyone else. We know we want to create a positive, fair, fun, respectful environment. Angie: A number of Mankato and North Mankato companies operate like ours. Dan: We aren’t real hierarchical. We receive a lot of team discussion and input from floor managers and rely heavily on the people coming in and out of the plant to share. We don’t use a top-down approach—with our managers it’s more horizontal. Angie: We know the work isn’t glamorous because we did it for years. It’s hard work. We know it’s hard to stand on your feet eight hours. Often times, businesspeople try to recreate in their business the kind of environment they had in their own home as a child—either that or do the exact opposite. What was growing up like for both of you? Dan: For me, it was very positive. My father, who works for us now part-time, is a banker who never missed a day of work. He is extremely connected to the community. That’s what he passed on to his kids. My mother stayed at home and raised us four boys—and you can imagine my mother’s challenges. Both my parents were about doing the right thing, being good people, respectful, engaging, and hardworking. We try to instill in our kids the same traits. What would happen if you did something wrong at home? Dan: Our house had four boys and we experienced plenty of consequences for our actions. I took that background with me to the classroom and into our family. I can totally get and relate to accepting consequences for my actions. There are consequences for right and wrong decisions. I think we have that here. If you come and work hard, opportunities exist for you here. Dan: I graduated from St. John’s in 1990 with a bachelor’s degree in history. After that, I moved to Belize as a volunteer to help start up a high school and later to Mexico to teach English for another year. I came back to the States and taught in New Mexico for six years. I’m a transient guy and was adventurous. Angie and I both have always been on the move looking for the next adventure. We met in Gallup, New Mexico, in 1992 while I was teaching and she was working at the hospital. After moving to Sarasota, Florida, where Angie’s parents lived, we moved to Mankato in 2001 with the idea of starting a healthy soup and salad company. It never got off the ground. Angie had her job in St. Peter and I taught during the day and got the kids at night. That’s when kettle corn started. What about your background, Angie? Dan: That’s where I think my mom and dad were great. They allowed us to play and my mom and dad were incredibly supportive of us playing, but we still needed to work and focus. If play came first, so be it, but you still had to get the job done. Angie: Play never came first at my house. But with faith and religion we had a simplistic, horizontal approach to life. You see God in the people around you. It’s one way of experiencing faith as opposed to reaching up vertically to get to God. It did influence me on how I see the world. As for my past, I went to Goshen College in Indiana and graduated with a bachelor’s in nursing before working in the ICU unit at Sarasota (Fla.) Memorial Hospital. I then decided I wanted to do volunteer work through the Mennonite Board of Missions for a year. I was in Ohio at a farmhouse working with children with hydrocephalus and brain injuries. I earned $30 a month, taught myself how to play guitar, and ate lots of popcorn. After earning a master’s degree in psychiatric nursing and gerontology from Emory University in 1991, I accepted an academic position at the University of Wyoming. But I had eight months to fill before starting the position. So I took a traveling nurse position at a hospital in New Mexico. Dan’s father was the CFO of the hospital, and that is where we met. Dan: Angie had a broken jaw when I met her. It was wired shut. I had broken mine as a college junior after being hit by a line drive. My jaw had been wired shut, too. When seeing her, I had found another person who had gone through my experience. That was the start of our conversation. Angie: Then we discovered we had been in Belize at the same time. I had taken a semester for graduate school to bicycle through the country. Our lives finally intersected in Gallup. What sort of stresses has working together put on your marriage? Dan: Our business goes 24 hours a day and it’s hard to shut it off—it’s so hard to shut it off. One thing Angie and I are great at is after we fight or argue we are able to drop it and move on. Angie understands me very well, is patient and knows when she can challenge me. Angie: We have our own opinions and neither one of us are ever totally right. Dan: To make decisions, we rely heavily on our team. We don’t have the answers to this business. We have a gut feel. Angie is incredible at marketing and public relations. She gets it. I get operations, sales, and tying in to people. There isn’t a lot of ego with us. We talk with people, get feedback, figure it out, and if we feel good about a certain course then we go with it. So what I hear you saying is it’s more important what is right rather than who is right. Dan: We could care less who is right. That is what we have created at our plant and offices. Everyone has input. Angie: We do have egos. We just try not to let them get in the way. Dan (shaking his head, disagreeing): I’m just saying that it’s not my way or the highway here. We have strong personalities, and are both confident, but we don’t pound fists and say it has to be my way or you’re out of here. Some people when seeing you have been rated by a statewide publication as a great place to work might think your business is one big joy ride. That doesn’t necessarily make for a great place to work. It sounds as if you have learned to set boundaries for your employees. Dan: We have. The challenges become greater as you add more employees. This doesn’t mean you have to veer away from who you are and the culture you created. Angie: The key isn’t in becoming rigid, but to create a framework so people have some independence and decision-making responsibilities while clearly knowing boundaries exist. When you talk to college students about starting a business, what do you emphasize? Angie: Commitment to the goal. People often think that because we own our own business we can work whatever hours we want. That’s not the case. We have to re-commit to what we are doing every single day. Dan: I really encourage the students. I’m fascinated by this excitement and energy that exists with some of these young people. A lot of them have that drive and commitment necessary, but don’t yet know owning a business can be such emotionally and physically exhausting work. Knock on wood; we have made it this far. What happens the day Frito-Lay, ConAgra, P&G or General Mills makes you an offer to buy your business? Or has it happened already? Dan: It hasn’t. We are very aware of all those companies. They are part of our world now. But what happens when they call? Dan: We realize that as a possibility. We have had interest in our company in the past and that was a major distraction. Since then, I have really tried not thinking about it and thought instead about having a growing and developing business. I see a potential problem. You didn’t start this for the popcorn or the money, you did it in part for the causes you have. If you sell the company, don’t you lose the ability to help your causes? Angie: Are you sure about that? When going into business, we had this preconceived idea about how business operates. It’s not necessarily true. We were looking from the outside in. If you’re going to make changes in the way business does business, you have to do it from the inside out. So I’m not certain your assumption exists or even if it’s true. Dan: We have a popcorn business. We are just trying to have it grow and see what kind of opportunities arise so we can impact the world on a bigger scale. From what I have learned, your company is generous giving to different causes. What sort of causes do you give to? Dan: We are very involved in youth and education. We get a lot of calls every day and for the longest time, we said yes, yes, and yes. People were asking for money and product all the time. Helping them is something we are proud of and we want to be able to continue. If we can play a role in helping youth and specific organizations become stronger and better, we have done our job. We have helped the community. Angie: Part of the instruction and counsel we have from consultants is that we have to focus our giving. We understand, but haven’t yet figured out how to do it. What mistakes have you made in business and how did you correct them? Angie: We took delivery on our Minnesota Vikings 45th Anniversary tin the same month their “love boat” scandal occurred. Most retailers pulled Minnesota Viking gear and product off shelves. No school wanted to sell our tins for fundraisers. It had been a huge investment for us. So we went to the Vikings organization. To their credit, they supported us. The ownership that year bought thousands of our tins and sent them out as gifts to season ticket holders. Dan: It wouldn’t have happened without the class of the Vikings organization. As for mistakes, we have made tons, which has included making bad decisions, buying wrong equipment, and having people in certain jobs. But we never dwell on our mistakes. Mistakes happen every day. We have been positive and haven’t given up. That’s a strength of our company and leadership team—if something happens, we deal with it and continue to move on. That’s why we have success on the floor. Our people don’t have their hands slapped when they make a mistake. We just say, good effort—and let’s figure out a solution here. Have you thought about going back to your old professions? Dan: Angie and I talk about this a lot. Some day, I will absolutely be back in the classroom teaching in some capacity or else involved with kids in some way. That’s what I love. I didn’t leave because I didn’t like it; but because of the business. I couldn’t do both at once. When I first started here full-time, I was popping kettle corn and not in a classroom where my passion was. Angie helped me see I can impact and teach others in a different way. And we have that here. We have created a culture where people enjoy being here, being part of everything, and helping them have a better life. It seems popcorn is secondary to you and just a vehicle to other things. Angie: It is—but kettle corn is still a priority. Quality matters. The popcorn may be the vehicle, but if the vehicle doesn’t run or is of poor quality, nothing matters. What we make has to be better than what everyone else makes. Our product is our spokesperson. It has to be the best. It seems you have, in a way, patterned yourselves after Newman’s Own salad dressings. You have a quality product and are using the profits to help your causes. Dan: If compared to Newman’s Own some day, I would be thrilled and honored. We are not there—yet. We have a dream, but right now I don’t know what that dream is. We are constructing it as we go. What did it feel like being on the Martha Stewart television show? Dan: It was extremely surreal. You are walking out on stage and people are screaming. The stage crew had them all worked up. I thought, Am I really going to be seen by millions of people? Cameras were everywhere. As we walked off after the show, a producer said we had been awesome. We didn’t even know what we had just said. It was such a blur. We were dealing with Martha Stewart. Was I really there? Angie: We had a few minutes beforehand to register all that. Martha Stewart reached out to us, which helped. I liked her. Born: 1968, in Mankato, Minnesota. Education: Loyola High School, 1986; St. John’s University, 1990, BA, history. Born: 1960, in Goshen, Indiana. Education: North Ridge High School (Ind. ), 1978; Goshen College, BS, nursing; and Emory University, 1991, psychiatric nursing and gerontology. Angie and Dan seem to remain true to their moral foundation. Measuring progress with authentic values and by the success of their team is a great way to do this. I enjoyed your article…congrats to Angie’s Kettle Corn for receiving BPOY 2012 1st Place.